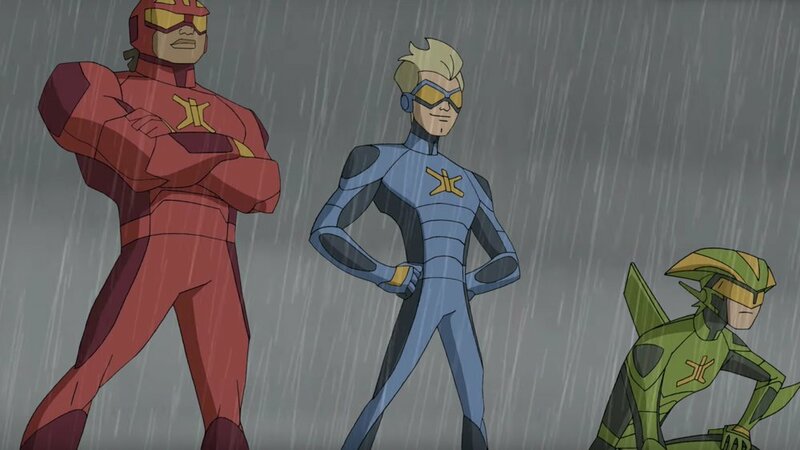 Netflix has released a full trailer for their upcoming animated series Stretch Armstrong and The Flex Fighters. The series was inspired by the classic late 70's-early 80's action figure that kids could stretch. The series has a very different kind of tone and vibe as the original toy, but it looks like a fun series that the kids will enjoy. The story follows a high school student named Jake Armstrong and his two best friends Nathan Park and Ricardo Perez and they are accidentally exposed to an experimental chemical that forever changes their lives. They are transformed into unlikely heroes who embark on a series of adventures. Stretch Armstrong and the Flex Fighters will feature some great voice talent that includes Scott Menville (Teen Titans Go!, Teenage Mutant Ninja Turtles) as Jake Armstrong/Stretch, Steven Yeun (The Walking Dead, Okja) as Nathan Park/Wingspan, Ogie Banks (Ultimate Spider-Man) as Ricardo Perez / Omni-Mass, Wil Wheaton (Teen Titans Go!, Star Trek: The Next Generation) as Rook, Felicia Day (The Guild, Supernatural) as Erika, Keith David(Adventure Time, Rick and Morty) as Kane, Kate Mulgrew (Orange Is the New Black, Star Trek: Voyager) asDr. C, and Walter Koenig (Star Trek, Babylon 5) as Mr. Savic. The series will consist of 26 episodes and will debut in late 2017.